The advent of smartphones has changed the way people get connected with the audiences today. In order to search for a piece of information, people prefer using mobile applications instead of a website. The reason is obvious, it is easier to access the smartphones in comparison to a laptop. In order to reach out to their audiences, companies are now emphasizing on developing mobile apps. Using different mobile apps is easier but developing them is not. There are a lot of algorithms a developer uses in order to develop a particular application. Let's dig in further and see what are the possible challenges that an application developer may face while developing a mobile app. Users prefer using applications that can provide them with maximum benefits. It is important for businesses to keep updating their apps with new features. Apart from fixing the bugs, app developers have to keep in mind that users do not get fatigued of using the same layout over and over again. For example, the newly added feature of deleting a message on Whatsapp has proved to be useful for the users of Whatsapp. Such updates are helping the users to stick onto that application for a long duration. Android and iOS are the two major operating systems for smartphones. These operating systems are upgraded from time to time. Android’s latest version is Android 9 Pie. Apple has also upgraded its version from iOS 1 to iOS 12.1. There are rumors that that iOS 13 is expected to be launched in a few weeks. Now, these constant updates in the operating system may sometimes affect the working of an application. New changes in the operating system may not stand compatible with the presently working applications, as a result, it may get crash. So for app developers, it is important that they constantly monitor their applications every time an application is upgraded. Today, app developers are well equipped with the technology. They try launching applications of their own. Now the problem with these app developers is that they make an application but fail to upgrade it and maintain it from time to time. With endless competitors available in the market, it becomes difficult for these application developers to find someone who can do the funding. Maintaining, upgrading, adding features or even changing the outlook of an app requires proper funds. Smartphone users have become smarter today. Due to an increasing amount of competition in the market, it becomes difficult to please the users and ask them to stick to their application. Once the users feel that they are finding it difficult to use an application, they would not prefer wasting even a single minute on that application. In order to stay in the race, application developers have to up their game. The developers will have to raise their graph either with the services or keeping the content high. This will make the developers feel comfortable using the app and stay connected with the users for a longer duration. App development firms face a lot of challenges while developing an application, the ones mentioned above are the most crucial ones. 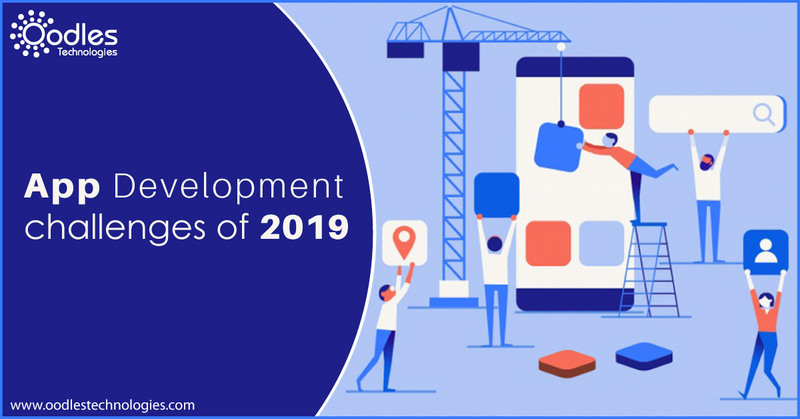 If an app development company or an app developer passes out the above challenges they would be able to make their application reach the top of the chart. Are you looking for a best software developer or a company with best software development services? Look no beyond than Oodles Technologies. In case of queries feel free to contact us.